The Catman, straight from the Destroyer album era. Authentically detailed costume and makeup, plus his drumsticks. 11 points of articulation include ball-jointed shoulders. "Beth" hears you calling as the band comes together in these excellently detailed 3 3/4-inch scale action figures modeled after the outfits worn on their iconic 1976 Destroyer tour. 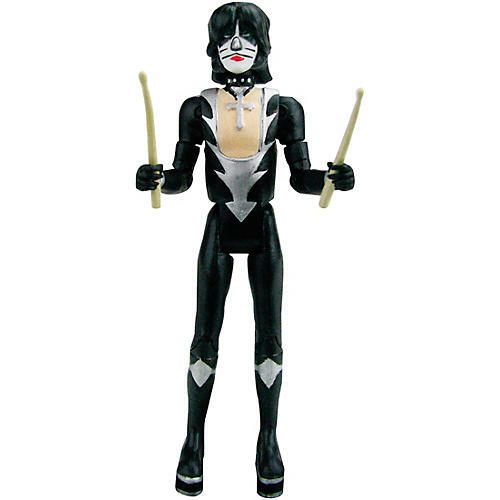 This KISS Destroyer The Catman 3 3/4-Inch Action Figure from Bif Bang Pow. presents Peter Criss as The Catman, in an authentic sculpted costume and makeup, with 11 points of articulation (neck, ball-jointed shoulders, biceps, elbows, hips, and knees) for excellent poseability. The Catman comes with drumsticks he can hold. Other KISS figures sold separately - collect them all. Ages 14 and up.